Donald J Horowitz: This	is	an	interview	of	Justine	Ndongo-Keller	and	I	am	Donald	Horowitz,	Judge	Horowitz	and	I	will	be	starting. And	Lisa	Nathan	will	join	in	the	interview	at various	parts. Is	that	all	right	with	you? DJH: Good. Thank	you	for	taking	the	time	to	meet	with	us. DJH: We	know	that	your	days	are busy	ones,	and	we’re	here	to	learn	of	your	experiences	and	your	thoughts,	and	your	reflections	on	the	ICTR,	on	the	inte-,	international	justice	and	on	being	a	human	being	dealing	with	the	issues	that	you	have	to	deal	with,	with	your	job	and	also	with	the	aftermath	of	a terrible	tragedy. DJH: While	we,	we have	been	reading	and	speaking	with	others	a	good	deal	about	this,	the people	who	may	view	your	interview, now	and	well	into	the	future,	maybe	25,	50	years	from	now,	may	not	know	a	lot	about	this	situation,	so	we	need	to	keep	that	in	mind	as	we	talk,	or	about	the	legal	system	that	we	have	in	place	now. DJH: So	at	times	during	the	interview	I	may	ask	you	to	explain	some	terms,	professional	terms	or	legal	terms	or how	some	aspect	of	the	tribunal	works	in	some	more	detail. It	will	help	if	you	think	that	you’re	speaking	to	an	intelligent	person	but	not	someone	who’s	trained	in,	in your	profession	or	in	the	legal	profession. Understand? DJH: Okay. So,	we’re	interested	in	understanding	why	you	think	some	things	and	so	we	may	be	asking	you	"why" a	lot. Sometimes	when	people	ask	you	"why" they	want	you	to	change	your	answer,	we	don’t	want	you	to	change	your	answer. We	want	it	to	be	your,	your answer. We	just	want	to	understand	better. DJH: So	let’s	begin	if	we	can	with	your	role	at	the	ICTR,	your – give	us	your	job	title	first	and	tell	us	what	you	see	as	your	role. Okay. 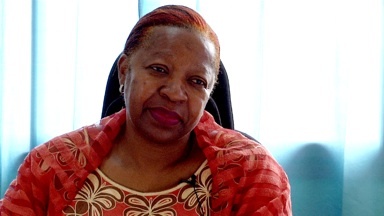 I’m	Justine	Ndongo-Keller	and	I’m	the	Chief	of	the	Language	Services	Section	at	the	ICTR. I	joined	ICTR	in	August	1996. I	started	working	in	Kigali	first	in	Rwanda	as	a	translator	interpreter,	then	in	March,	on the	first	of	March	1997	I	was	sent	to	Arusha	because	the	trial	were going	to	start. Basically,	in	Kigali	we	were	doing	translation. We	were	translating,	you	know,	preparing	documents	for	the	beginning,	you	know,	the	commencement	of	the	trials. DJH: From what	languages	to	what	languages? I	basically	work	from	English, for	the	ICTR, from	English	into	French. Some	other	colleagues	do	it	from	French	into	English,	then	we	have	other	colleagues	working	into	the	Kinyarwanda	language	which	is	the language	spoken	in	Rwanda. So	some	colleagues	when	I	joined	in	1996,	I	met	a	small	group	of	people	that	were	already	there	working	into	French, a	few	of	them, and	other	working	into	English,	and	a	handful	working	into	the	Kinyarwanda	language	as	well. DJH: Okay,	and	when	you,	you were	translating	documents	at	that	time	in	Kigali? Mostly	witness	statements,	and	then	we	were	servicing	investigators’	meeting	as	well,	and	coordination	meetings	because	the	team	will	want	to	coordinate	the	job	that	they	would	have	done	on	the	field,	you	know,	during	the	week	or	during	the	month. So	we'd be	interpreting	during	these	meetings	of	investigators. DJH: Okay,	so	you	would	be,	if	I’m	understanding	you	correctly,	there	were	sometimes	you	just	– you	were	doing	documents. DJH: Written	translations. And	other	times	when	you	are	actually	in	meetings	as	they	were	going on. DJH: And	were	you	doing	simultaneous	translation? DJH: Consecutive	translation. Could	you	explain	the	difference	between	consecutive	and	simultaneous? And	simultaneous. Consecutive	in-,	interpretation	is	where,	whereby	a	person	or	somebody	will speak	for about ten,	15	to	20	minutes,	then	you	take	notes	and	then	you	have	to	give	it	back	whatever	you've heard	in	the	other	language. You	know, you	take	notes	then	you	interpret,	and	the	person	speaks	again,	you	take	notes	and	then	you,	you,	you bring	it	back,	you	give	it	back	to	whoever	is	listening. DJH: And	simultaneous . .	.
And	the	simultaneous	interpretation	– you,	you,	you are	in	a	booth,	you	know,	just like	you	saw	in	the	courtroom, and	it	is	simultaneous. As	the	other	person	is	speaking,	the	speaker	is	speaking,	you	are	translating	into	the	other	language. So	there’s	a	gain	of	a	lot	of	time	that,	you	know,	you,	you save	by	working	in	the	simultaneous	mode. DJH: And	is	the	simultaneous	mode	tend to	be	more	literal	translation	because	you’re	not	having	to	remember, even	with	notes, 20,	15	or	20	minutes? It	comes	back	to	the	same	because	literal	will	be	putting	too	much	emphasis	on	the,	the form	whereas	we’re	talking	about	the	content,	the	merits	of	it. You	are	translating	ideas	so	whether	it	is	the	consecutive	mode	or	the	simultaneous	mode,	it	comes	back	to	the	same	thing. The	question	is,	“What	is	the	person	saying? Are	you	conveying the	same	message	to	whoever	is	listening,	to	the	listener? What	the	speaker	said,	is	it	exactly	what	you	are	telling	the	other	person?”	Yeah. It	comes	to	the	same	thing	because	we	are	– i-, it’s	communication. Do,	do	– at	the	end,	you	know,	has	the	other	person	understood	what	the	speaker	was	saying,	yes. DJH: Okay,	and	so	you	were	doing	– when	you	said	you	were	at	meetings	with	the	investigators,	were	these	meetings	of	just	the	investigators	or	also investigators	and	the	people,	the	witnesses	or	the people	who	were	. .	. It was	– what	we	were	doing	at	my	level	was	basically	investigators. But they	will	go	to	the	field	with	what	we	call	at	that	time	Language	Assistant;	people	from	the	country	who	spoke	either	French	and	Kinyarwanda	or	English	and	Kinyarwanda. They	will	go	to	the	field	and	interview	witnesses,	you	know. The,	you	know,	“Something	happened	here. Were	you	there? What	did	you	see?” Or	victims,	people	who	were	known	to	be	victims,	you	know,	by	investigator. I	don’t	know,	you	know,	how	they	came	to	know	about	these	people	because	basically we	are	technicians. We	take	it to	where, from	where	they,	they stop. So,	they	will	go	to	the	field,	interview	witnesses,	come	back	with	the	witness	statement. We’ll	translate	them. This is	written	translation	and	then	they	will	have	this	coordinating	meeting,	coordination	or coordinating	meeting	with	the	Prosecutor,	and	then	we	will	be	servicing	the	meetings. DJH: You’ll	be	servicing	the	. .	.
DJH: Meetings,	okay. Did	they	sometimes	when	they’re	going	out	to	meet	these	witnesses	or,	or victims,	did	they	sometimes	bring	back	recordings	like	tape	recordings	.	.
DJH: Okay. And	then	you	would	translate. W-,	there,	there,	there’s	a,	there	was	a	transcription	first. They	will	tran-,	transcribe,	you	say	that in	English? DJH: Yes. Yes,	that’s	the	right	word,	yeah. Transcribing	the	cassette	. .	. They	will	transcribe	the,	the,	the cassette from	the	Kinyarwanda,	sometime	into	French	then	whoever	is	translating	from	French	into	English	would	take	it	from	there	and	do	the	translation. But	we	needed	it	to	be	put	in	a	written	form	first	in	the,	the first	language,	the	original	language,	then	we	will	do	the	translation	later. DJH: Okay. So	if	it came	back	the	tape	was	in,	tell	me	the	na- . .	.
DJH: Then	it	would	transcribed	into	Kinyar-,	Kinyarwanda	. .	.
First, then	into	English	and	into	French. DJH: First,	and	then	you	translate	it	into	English	and	French.